Home » PMP Resources » How To Pass Your PMP® Certification In 2018? How To Pass Your PMP® Certification In 2018? Project Management is considered as the hottest career option of IT professionals for the high demand that it is receiving from many organizations. With these organizations looking for trained Project Management professionals, many IT professionals are choosing the most coveted certification for Project Management Professionals PMP®. Project Management Institute (PMI) is the certifying body offering this most prestigious PMP® Certification. They have issued a guide called PMBOK® Guide and it covers the PMI’s project management framework that is well aligned with current project management practices. In this competitive global economy, PMP® certified professionals can effectively bridge the knowledge gap, also can showcase their significant project management skills and experience in Project Management field. Furthermore, the PMP® certified professionals are on the higher earning side when compared to their non-certified peers. As per Project Management Institute (PMI), the number of IT professionals who hold the PMP credential has increased exponentially over the past five years. PMP® certification can give an edge in the job market for IT project managers. However, there are eligibility criteria established by Project Management Institute that needs to be met. Candidates need to hold a four-year degree and with 3 years of project management experience. Those 3 years experience should hold 4,500 hours spent leading and directing the projects. Furthermore, 35 hours of project management education is also mandatory. In absence of four-year degree and with a secondary diploma (high school or the global equivalent) then it is required to have at least five years of project management experience with 7,500 hours spent leading and directing the projects. Furthermore, 35 hours of project management education is also mandatory. How to apply for PMP®? To apply for PMP®, candidates need to follow these steps. Complete the online application process that is available at PMI’s official site www.pmi.org. Pay the fees. Please note here that PMI members will receive a significant discount on the exam costs. When you complete the audit process, you get 1 year to pass the exam from the time your application is approved by PMI. You can visit any Prometric center or go to Prometric online website to take up your PMP® exam. The examination is scheduled for 4 hours consisting 200 multiple choice questions. You will be able to view the results immediately after completing the exam. Once you have passed your PMP® exam, you can start using this credentials right away. 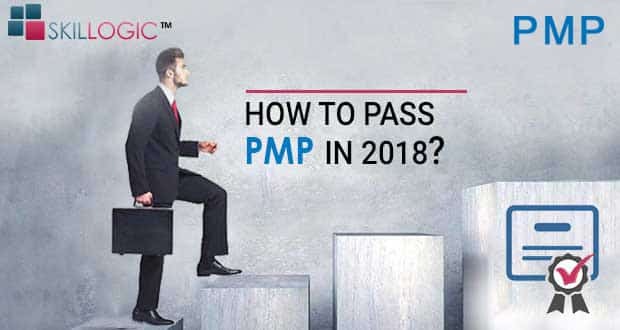 The PMP® exam is indeed a challenging one and if you are not able to clear it in the first attempt, don’t panic you still have two more attempts left. You can apply for two attempts within one year of your eligibility period by paying the fees again. Many project management aspirants have quoted that PMP® exam is difficult and it is hard to crack the exam in the very first attempt. It is definitely a nerve-wracking challenge but with a comprehensive training and a structured study plan, you will be able to successfully pass the PMP® exam. SKILLOGIC™ is a renowned training provider who has successfully completed 6000 PMP certification training so far. Their latest specialized program ‘PMP in first attempt‘ focuses on cracking the PMP® certification exam in the first attempt. This program has been designed by industry experts that consists of comprehensive 35 days learning plan with 5 days of Classroom Training and 30 days of guided self-study. With SKILLOGIC™, cracking PMP® exam in the first attempt will no longer sounds hard. For more details about, training schedules, pricing, locations, etc, please visit website. Previous: How Much Do PRINCE2 Certifications Cost In India? Next: How Much Does ITIL Certifications Cost In India? Shriram is has 15+ years of experience in Project Manager and DevOps consultant. He is passionate about teaching best practice Project Management framework such as PMP, Agile and DevOps.